In honor of ABCWednesday's "K" week, I thought I'd share some of my favorite comics and graphic novels that teach kids (of all ages) about the consequences (and often the horrors) of war. last few years. They are exquisitely written and drawn and the number of school and curriculum-appropriate books continues to expand. 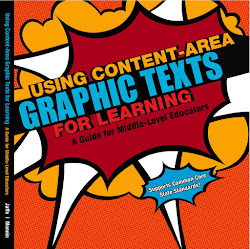 While engaging and empowering all levels of readers, the images make it easier for readers in relate to and incorporate their content. This makes them powerful classroom non-fiction tools - especially when teaching, relaying and depicting the devastating affects of war. Barefoot Gen by Keiji Nakazawa, translated by Project Gen (Last Gasp of San Francisco, 2004 - ages 12+), chronicles the aftermath of the Pacific War. Barefoot Gen is an important work and classroom addition. It's considered one of the most important anti-war manga ever written. First, it relays an informed accounting of Japan’s role in World War II and is a strong anti-war piece that cannot and should not be silenced. Second, Nakazawa relates a strong geopolitical perspective of the war, discussing the power of political machines, “divine rule” versus democracy, and the power individual citizens must exercise to secure their rights and uphold their values. Finally, this work provides a window for understanding and comparing Eastern and Western cultures — where they meet, where they clash, and what we can and cannot assume. 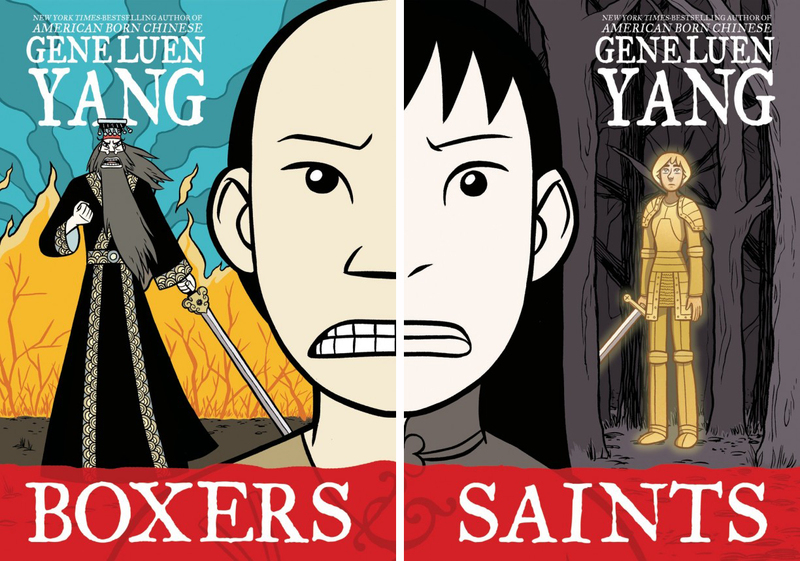 Boxers and Saints (First Second - ages 10+) by Gene Yang - National Book Award finalist and two-book set that recounts the Boxer Rebellion (1900) from both sides - that of the Boxers (Chinese peasants who believed they could invoke ancient Chinese Gods/heroes to help them battle Western Imperialism and the Chinese Catholics they converted) and the Saints (the Chinese converts who wanted to bring peace to war-torn China. Dogs of War (Scholastic - ages 9+) by Sheila Keenan and Nathan Fox, consists of three different stories set in three different wars: World War I, World War II, and the Vietnam War. While the stories are fiction, they've been meticulously researched and relayed in rich detail. Each vignette relates the trails and traumas,and dangers the dogs, their handler and fellow soldiers risk in battle, and the tolls the wars took on all concerned. 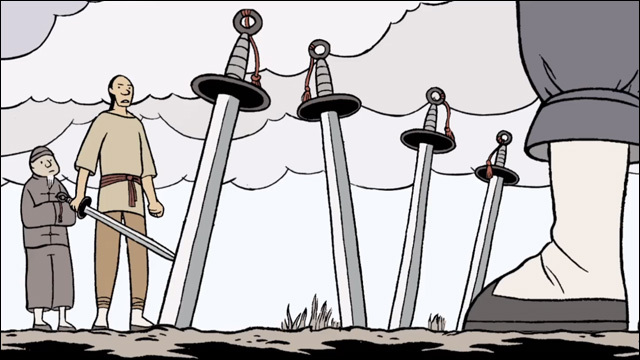 Jerusalem by Boaz Yakin and Nick Bertozzi (Ages 12+) - about the personal and political issues and decisions various members of a Jerusalem family must face in war-torn Jerusalem 1940-48. The story begins with the British Mandate giving way to a United Nations Partition Plan that then gives way to civil conflicts and the Arab-Israeli War of 1948. It follows Yakin's family's history while following the history of Jerusalem as its characters wrestle with ideals, faith and hopes. 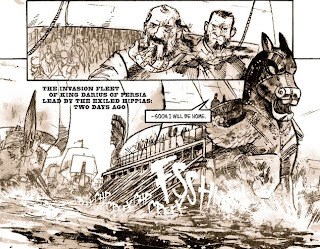 Marathon by Boaz Yakin and Joe Infurnari (First Second Books, Grades 6+) tells the story of Eucles and The Battle of Marathon. Eucles, an Athenian messenger in the year 49 ran over 300 miles to save Ancient Greece from being subjugated into the Persian Empire. The Battle of Marathon was the turning point in ancient history, and the foundation of the modern Olympic games. Maus by Art Spiegelman is a retelling of his parents' Holocaust experience which Spiegelman tells through conversations with his father. The Nazi's are depicted as cats, and their victims as mice. This cartooning approach makes the story more accessible and somewhat less threatening, empowering readers to more comfortably explore the realities, fears and guilt the holocaust raises. Maus has won many awards, including the Pulitzer Prize in 1992 (recommended for mature middle school readers and older). 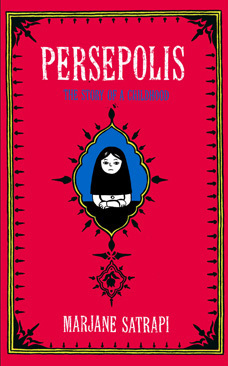 Persepolis by Marjane Satrapi (ages 10+) is the story of Marjane Satrapi’s childhood and coming of age within a loving, educated family that lived in Tehran during the Islamic Revolution and Iran-Iraq War. It is drawn in simple, stark, black and white ink with style, poignancy, and elegant detail as well as occasional flourishes (usually in the dream sequences) traditionally found in Eastern art. Resistance Trilogy (First Second - ages 9+) by Carla Jablonski and Leland Purvis - a graphic novel trilogy is about life in occupied France during World War II. The main characters must decide whether to collaborate with the Germans (to gain 'favors') or delay gratification and face rationing of supplies as well as struggle through the war without knowing whether their father has survived. This trilogy is a wonderful (historical) fiction story that accurately relates life in France in the late 1930's to early 1940's. Rust (ongoing series, Archaia) by Royden Lepp (Ages 9+) Rust, brilliantly illustrated in sepia tone (giving the story a Dust Bowl and post World War I feeling) is all about life after a horrific war fought by men and robots. The land, the people and their families have been devastated. With flashbacks from the war, the three volumes (there's a fourth on in the works) chronicle one robot and a family who harbors him. For more, please read this Review of Rust detailing each book and containing teaching and book group discussion suggestions. Zahra's Paradise (ages 12+) is a webcomic and graphic novel by Amir with illustrations by Khalil (both have chosen to remain anonymous for political reasons), published in 2011 and published by First Second Books. Its story takes place in Iran, June 2009 after one of the great street protests following the elections. And, while it is a story about human rights and the turmoil of a troubling time, it also about the love of a people who help this mother through her heartbreaking ordeal. Please leave your favorites, or your opinion about these books in the comments below. Not really my type of reading, but I sure know who I am going to tell. I would add Grave of the Firefly but its a anime movie but also about war. Love Graphic Novels but havent read any of this yet. I wonder if these are available in our library. Most of them should be, particularly Maus and Perseoplis. If not, ask, I'm sure they'll be able to get them from other ancillary libraries. Thanks for the comment. Hi Meryl! I always ask myself: who starts a war and why? Wars are so useless. Nobody wins. Thanks for your ideas and for this post. MANY years ago, before Maus, I used y chat with Art Spiegelman, He was working on this oversize art mag called RAW. Interesting duded. I know RAW. Wow, now I'm really jealous... great Kelloggs cereal bowls AND conversations with Spiegelman. You are very cool! I love graphic novels, they are a ton of fun to read!